Digital signage is a communication tool for broadcasting various types of information such as photos, slide shows, HD video, flash animations, web pages, PDF files and can also be used to play audio files. The Digital signage will ensure a fast and easy broadcast of information towards your customers and employees. Why should you use a Cloud based digital signage system ? Using a cloud based digital signage is perticularly effective when you dispose of multiple screens and you do not want to change their content one by one. It's even more efficient if you have to manage screens in different locations. With Digital Signage on the Cloud you are now able to manage a worldwide digital signage system. 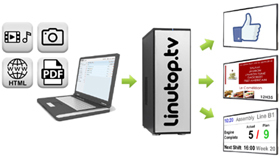 Linutop TV enables to centralize the management of multiple screens in a network. Light, easy and fast to set-up, this solution is available in two different mode, the cloud based mode, which enables you to manage all your screens wherever they are as long as they are connected to Internet, and a local mode, which is not connected to Internet, you will then be able to manage all the screens that are connected to your private network, this version is completly disconnected from Internet which makes it totally private. 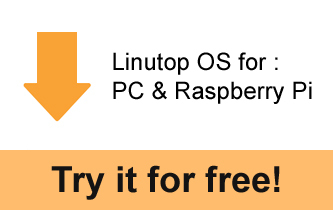 Moreover the Linutop Kiosk Software is available for PC and Raspberry Pi. A free version is downloadable here. Linutop mini computers have other advantages. Since they are fanless, they are totally quiet and consume very few energy. Indeed, Linutops need 10 times less energy than ordinary PCs to operate and are an ideal choice for professionals intending to use them all day. They can also turn into web kiosks within a few clicks thanks to Linutop Kiosk software, the Digital signage software.